Quick side story: I got a phone call one day from one of my friends getting back into magic and wanting “his cards” back from my collection, as well as buying singles off of me. I gave him a flat rate for the collection because I didn’t want to go through each card. He wouldn’t budge and I had to pull his stuff anyway, so I sat there inventorying my cards and got a little itch, then a tingle, then considered that magic could have a website or even another PC game… I then found MTGO. Now that I’m 99% online, I’m probably back for good. One of the things I was around to experience was the introduction of Vanguard, in 2005. Basically, Vanguard means that your deck also contains an Avatar card that serves as a game changing enchantment that your opponents can’t remove. The official line on the “format” can be found here. = "Opponent has lost connection"
After vanguard was released, those types of things, in the casual room at least, came and went, and most people chose to do other things with their avatar than the obvious, and it became clearer that such things did not break the format in and of itself. Then once Standard Vanguard tournaments began, people began to see what could really break a format. 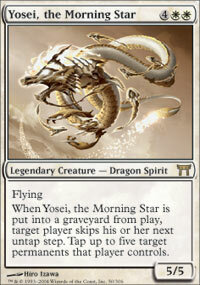 At first people were trying to do unique things with their avatar until people realized that the Hell's Caretaker avatar and Yosei, the morning star, pretty much ended the game and ruined the format. = "I'm not playing this game anymore"
Therefore Wizards Development saw fit to neuter the Caretaker to what we see above, going from +0 Hand / +4 Life to -2 Hand / -2 Life. Once he fell off the map, a new breed of tournament decks popped up. While on one hand, the casual crowd may consider the "cool things"® that could be done with each avatar, the opposite approach, as seen on the tournament scene, often displays a "Which Avatar will make my deck win more” technique to deckbuilding. The current metagame features major Standard format decks such as Dragonstorm controlling the top 8 with the addition of the Prodigal Sorcerer avatar which just makes them faster and more consistant. I'm sure that in some ways this make Wizards happy that the most dominate, or competitve avatar appears to be one that everyone got for free in their "avatar booster". While I have played in the Vanguard tournaments before, I will mainly focus upon the casual, and attempt to shine a spotlight on Vanguard in general to garner interest. If I were selling vanguard, I’d simply want you to share the excitement that I have for this area of MTGO, and thus the purpose for my series of articles. I’ve entitled it “Fully Functional” because while online your avatar represents who you are in the room, and for years has been just an image (that gets skeletonized) during your games. However, now with Vanguard games, your avatars are fully functional as a card and deck building inspiration or support. This in itself was a point for contention amongst the community (“they weren’t worth anything before and now Wizards is going to shock the community by making them DO something?”), but overall the complaints were minor and sometimes silly, and really, a story for another time, I promise. What I’d like to begin with is current events. With the release of Future Sight, two new avatars have been introduced. Jhoira, and Heartwood Storyteller. Frank Karsten introduces them in his article here. 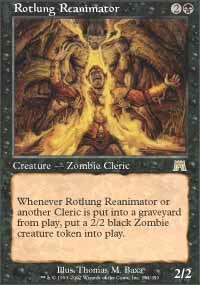 I like what Wizards has done in recent history with Momir and now Jhoira, and that is to create a true online experience with format shaping avatars. What I mean is that, a Momir avatar and basic lands are enough to pump out random creatures, then almost everyone has an opportunity to play any creature online, and therefore an accessible format is created and is successful enough to where tournaments are played. I guess you could say that these avatars "maximize your input/output ratio", in that you invest in an avatar and basic lands, and now have the ability to play anything online should you be luckly enough. With Jhoira, she is similar to Momir except for sorceries and instants rather than creatures, and yet different enough to be fun (your choice of three and a static cast cost). While there was criticism about the avatar being much weaker than Momir, after having played against countless Jhoira decks, I can say that they are effective and fun. Well, fun for the user, the opponent usually ends up with their hand stripped and lands destroyed "at random". The other benefit to Jhoira is that some random event, like popping Phage the Untouchable into play, doesn't cost you the game because you can choose which spell to play, and IF you would like to play it. Now at this point I could provide you with a Jhoira deck to show you how fun it is, but Jhoira basic is just basic lands and the avatar and everyone seems to be playing Karsten’s type of deck for standard vanguard. Therefore I will present to you my Jhoira hate deck (I’m also the guy that played Suppression Field during Momir week and Crystal-Witness in a field of affinity). I left it really raw with a sample of one/two-of ideas, and 4 of the things that really matter. The idea is that Megrim makes the Jhoira player cry every time they pitch a card for their ability. Better yet is that if you clear your hand, or cast Ignorant Bliss with Megrim in play, you deal 4 damage thanks to Lyzolda’s combined hellbent abilities (although 6 from The Rack is so much sweeter if you clear their hand with Delirium Skeins). Make sure you stack the Lyzolda and Ignorant Bliss triggers properly so your opponents discard and get damaged before your hand comes back. Extirpate is mainly in there to kill Life from the Loam. Even if you don’t play against a Jhoira player, I’ve often done 16 points of damage on turn 5 with Jaya in play, and a Rift Bolt unsuspending. A trick you’re going to have to learn with this deck is to hold CTRL while announcing and casting spells so you don’t give up priority and can stack several burn spells or abilities for them to resolve with your hand empty. Putting spells and abilities on the stack, and not passing priority by holding CTRL, are both MTGO skills that are easily transferable to other cards and decks and a requirement if you want to respond to your own spells (by copying them, etc.). I hope each of my choices makes your gears turn, and should be relatively friendly on your budget (Lyzolda was last going for 5 tix). One last thing while I have an audience, and this is a good enough place an any for a rant, is when you create a game which format sits within another format, such as Rainbow Stairwell in the Singleton format, or in this case, Jhoira Basic in the Standard Vanguard, Extended Vanguard, or Classic Vanguard, please specify this in your "Comment" section when your create the game. If the table says "Standard Vanguard", dont' tell me "Jhoira basic you moron" once the game starts, or "I said no black cards you idiot'. I'm pretty much resigned to creating my own table to avoid such whining, but I'd just like to point out that not everyone plays the way you do, has the same views on Casual as you do, nor to they all join games the way you do (there's a table view (the grid), and there's clicking a name posting a chat message to sit at the table). Let's offer some grace to others, especially if we're trying to grow a format, and not turn people off to the experience. I’d like to thank you for reading today and hopefully in the future. yup it's totally fine to rank your own article. I thought about a FUT common that grants an ability to every creature, and a TSP uncommon that adds counters to creatures of a certain type, it is even possible to combo them with Doubling Seasson or Paradox Haze... and there is always an elf that would benefit of beeing something else. And about the rating, I don't know, poke Heath for details. A nice little overview, the article seems a little short, but thats nothing to complain about when the content is right. By the way, there is a way to abuse the Seshiro Vanguard in STD VAN again. Hint: It's about some green guys. Ok I'll bite. Nether Traitor as a Spirit Saproling? Thanks for the feedback, I'll try to make the next one longer when I submit it. Luckily it'll be a fun one with instant combos like you mention here. I'm really grateful you gave the vanguard avatars enough thought to post a little challenge like that. Side question: when writers post on the own comment's section they're rating their own article?